BIRDS & BEES FARM started in Spring 2005 from a strong feral colony of bees in the pool shed of In- Law's Fritz & Jean Wainwright, and quickly grew to almost 100 hives in 2012. 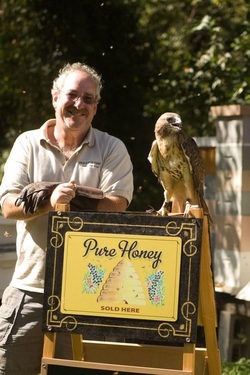 Beekeeper and Falconer Hugh Pribell had a vision of creating a business that could serve the needs of those with an appetite for unique gourmet specialty foods, and this was a start! Having raised gamebirds for over 30 years, Hugh has created wonderful dishes utilizing quail and quail eggs with his extensive knowledge and passion for perfection. Our beeyards include both stationary and migratory hives. Three main bee yards, two in Columbus and one in Chesterfield, each produce wildflower honey of uniquely different flavors, due to the extreme different nectar sources found in each area! BIRDS & BEES FARM HONEY went online in the Winter of 2012 and now manages over 200 colonies in over 12 registered beeyards. Hugh's passion for creativity and perfection has ensured success, long before he launched his business and sold his first bottle of honey. Critics have been raving ever since. Customers agree... Birds & Bees Honey is simply the best! Birds & Bees Farm Honey provides both wonderful gift ideas, as well as economical packaging for personal use, delivering only the finest local honey. Gift crates are each handmade, one at a time by Hugh himself, using cedar and copper nails. Stop on over and taste for yourself, the honey from Birds & Bees Farm!